Welcome to Islands Beaches Guide, an unofficial guide to Pašman beaches. In this online guide, you’ll find maps, photos and details of facilities for all the main beaches. Jackie O. is a sandy beach in the middle of the island of Pašman in the place Mrljane with direct access to the main island’s road. The popularity of the beach is greatly contributed by Jackie Kennedy Onassis. On her honeymoon with new husband Aristotle Onassis, she spent several days anchored in the bay and enjoyed sunbathing and swimming. The beach is quite popular for families with children because of its soft sand, shallow water and the natural pine tree shadow. 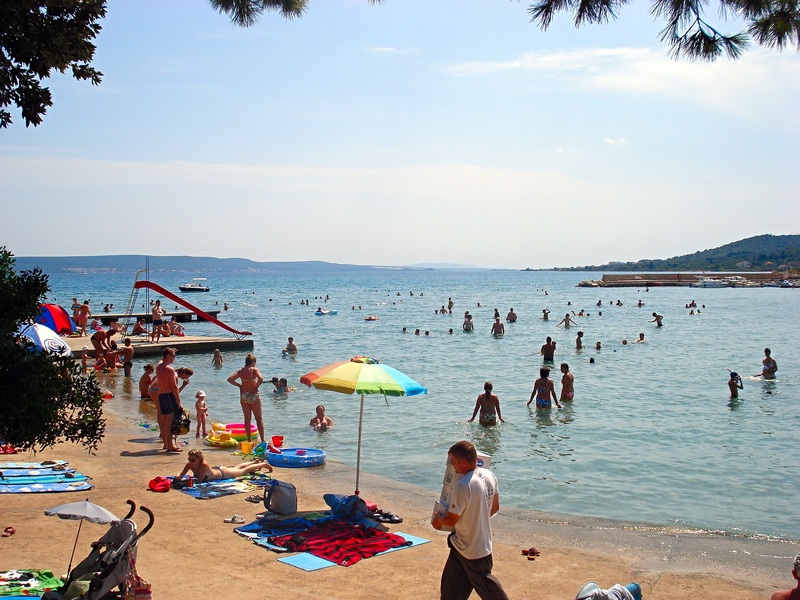 Sovinje is a naturist beach within the FKK camp Sovinje. It is positioned at the end of the islands main road, on the outskirts of place Tkon. This kind of sandy beach is a natural phenomenon and there are only a few beaches on the Adriatic sea of the same configuration (the most known is the island of Susak). The secret of its beauty lies in the constant sedimentation of sand from the surrounding cliffs. The beautiful sandy beach Tratica, which is located in the place Kraj, is known for its beauty and crystal clear water. Since the beach is sandy and very shallow, it is very popular among families with small children and non-swimmers. Matlovac beach is sandy and ideal for children. Parking is available in the harbour and shopping facilities are close to the harbour. There are, in addition, boat docks. On the beach itself, there is a beach café, benches in the shade of the pine trees, a children’s playground, a volleyball court, showers, toilets, changing rooms, a slide, a beach kiosk and an ice cream stand. Apart from the mentioned beaches, there are numerous hidden bays for those who wish to hide and enjoy the intimacy and untouched nature that provides the island of Pašman. Soline bay (zaljev Soline) is one of the most beautiful bays on the island of Pašman and features a sandy beach that is very popular for its therapeutic and healing effects. Locals say taking a sand bath is a natural therapy with powers to cure many medical conditions.